Le vendredi 10 novembre 2006. En 1876, un Stevenson de 26 ans navigue sur les rivières de France, entre Maubeuge et Conflans-Sainte-Honorine. Il arrivera ensuite par la route à Grez-sur-Loing, où il fera connaissance avec sa future femme, Fanny Osbourne. Voici un extrait (en anglais dans le texte) de An Inland voyage (La France que j’aime), où l’écrivain décrit son séjour à Compiègne. WE put up at a big, bustling hotel in Compiègne, where nobody observed our presence. Reservery and general militarismus (as the Germans call it) were rampant. A camp of conical white tents without the town looked like a leaf out of a picture Bible ; sword-belts decorated the walls of the cafés ; and the streets kept sounding all day long with military music. It was not possible to be an Englishman and avoid a feeling of elation ; for the men who followed the drums were small, and walked shabbily. Each man inclined at his own angle, and jolted to his own convenience, as he went. There was nothing of the superb gait with which a regiment of tall Highlanders moves behind its music, solemn and inevitable, like a natural phenomenon. Who that has seen it can forget the drum-major pacing in front, the drummers’ tiger-skins, the pipers’ swinging plaids, the strange elastic rhythm of the whole regiment footing it in time—and the bang of the drum, when the brasses cease, and the shrill pipes take up the martial story in their place ? A girl, at school in France, began to describe one of our regiments on parade to her French schoolmates ; and as she went on, she told me, the recollection grew so vivid, she became so proud to be the countrywoman of such soldiers, and so sorry to be in another country, that her voice failed her and she burst into tears. I have never forgotten that girl ; and I think she very nearly deserves a statue. To call her a young lady, with all its niminy associations, would be to offer her an insult. She may rest assured of one thing : although she never should marry a heroic general, never see any great or immediate result of her life, she will not have lived in vain for her native land. But though French soldiers show to ill advantage on parade, on the march they are gay, alert, and willing like a troop of fox-hunters. I remember once seeing a company pass through the forest of Fontainebleau, on the Chailly road, between the Bas Breau and the Reine Blanche. One fellow walked a little before the rest, and sang a loud, audacious marching song. The rest bestirred their feet, and even swung their muskets in time. A young officer on horseback had hard ado to keep his countenance at the words. You never saw anything so cheerful and spontaneous as their gait ; schoolboys do not look more eagerly at hare and hounds ; and you would have thought it impossible to tire such willing marchers. 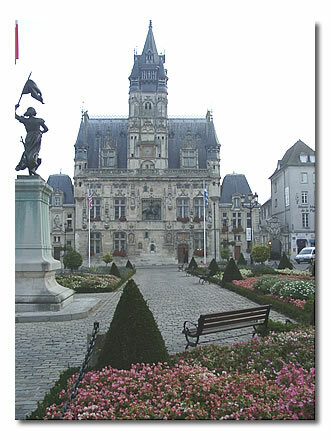 My great delight in Compiègne was the town-hall. I doted upon the town-hall. It is a monument of Gothic insecurity, all turreted, and gargoyled, and slashed, and bedizened with half a score of architectural fancies. Some of the niches are gilt and painted ; and in a great square panel in the centre, in black relief on a gilt ground, Louis XII rides upon a pacing horse, with hand on hip and head thrown back. There is royal arrogance in every line of him ; the stirruped foot projects insolently from the frame ; the eye is hard and proud ; the very horse seems to be treading with gratification over prostrate serfs, and to have the breath of the trumpet in his nostrils. 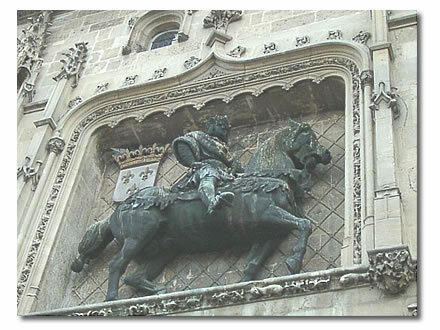 So rides for ever, on the front of the town-hall, the good king Louis XII., the father of his people. 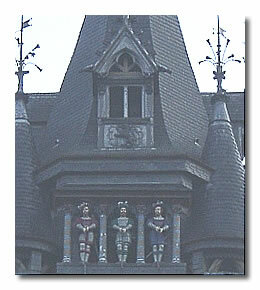 Over the king’s head, in the tall centre turret, appears the dial of a clock ; and high above that, three little mechanical figures, each one with a hammer in his hand, whose business it is to chime out the hours and halves and quarters for the burgesses of Compiègne. The centre figure has a gilt breast-plate ; the two others wear gilt trunk-hose ; and they all three have elegant, flapping hats like cavaliers. As the quarter approaches, they turn their heads and look knowingly one to the other ; and then, kling go the three hammers on three little bells below. The hour follows, deep and sonorous, from the interior of the tower ; and the gilded gentlemen rest from their labours with contentment. I had a great deal of healthy pleasure from their manoeuvres, and took good care to miss as few performances as possible ; and I found that even the Cigarette , while he pretended to despise my enthusiasm, was more or less a devotee himself. There is something highly absurd in the exposition of such toys to the outrages of winter on a housetop. They would be more in keeping in a glass case before a Nurnberg clock. Above all, at night, when the children are abed, and even grown people are snoring under quilts, does it not seem impertinent to leave these ginger-bread figures winking and tinkling to the stars and the rolling moon ? The gargoyles may fitly enough twist their ape-like heads ; fitly enough may the potentate bestride his charger, like a centurion in an old German print of the via Dolorosa ; but the toys should be put away in a box among some cotton, until the sun rises, and the children are abroad again to be amused. In Compiègne post-office a great packet of letters awaited us ; and the authorities were, for this occasion only, so polite as to hand them over upon application. In some ways, our journey may be said to end with this letter-bag at Compiègne. The spell was broken. We had partly come home from that moment. No one should have any correspondence on a journey ; it is bad enough to have to write ; but the receipt of letters is the death of all holiday feeling. "Out of my country and myself I go." I wish to take a dive among new conditions for a while, as into another element. I have nothing to do with my friends or my affections for the time ; when I came away, I left my heart at home in a desk, or sent it forward with my portmanteau to await me at my destination. After my journey is over, I shall not fail to read your admirable letters with the attention they deserve. But I have paid all this money, look you, and paddled all these strokes, for no other purpose than to be abroad ; and yet you keep me at home with your perpetual communications. You tug the string, and I feel that I am a tethered bird. You pursue me all over Europe with the little vexations that I came away to avoid. There is no discharge in the war of life, I am well aware ; but shall there not be so much as a week’s furlough ? We were up by six, the day we were to leave. They had taken so little note of us that I hardly thought they would have condescended on a bill. But they did, with some smart particulars too ; and we paid in a civilised manner to an uninterested clerk, and went out of that hotel, with the india-rubber bags, unremarked. No one cared to know about us. It is not possible to rise before a village ; but Compiègne was so grown a town, that it took its ease in the morning ; and we were up and away while it was still in dressing-gown and slippers. The streets were left to people washing door-steps ; nobody was in full dress but the cavaliers upon the town-hall ; they were all washed with dew, spruce in their gilding, and full of intelligence and a sense of professional responsibility. Kling went they on the bells for the half-past six as we went by. I took it kind of them to make me this parting compliment ; they never were in better form, not even at noon upon a Sunday. There was no one to see us off but the early washerwomen—early and late—who were already beating the linen in their floating lavatory on the river. They were very merry and matutinal in their ways ; plunged their arms boldly in, and seemed not to feel the shock. It would be dispiriting to me, this early beginning and first cold dabble of a most dispiriting day’s work. But I believe they would have been as unwilling to change days with us as we could be to change with them. They crowded to the door to watch us paddle away into the thin sunny mists upon the river ; and shouted heartily after us till we were through the bridge.